Double barrel pinfire sporting gun by George H.Daw. A fine 12-bore pinfire double-barrelled rotary-underlever sporting gun by George H.Daw. 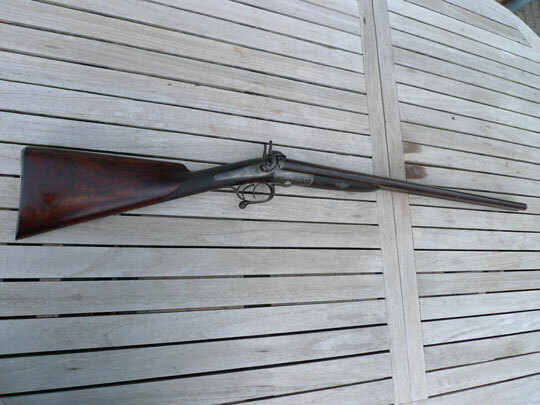 This shotgun is in an overall excellent condition. Excellent highly figured French walnut stock with a beautiful chequering on grip and fore-end. Both back locks work perfect (strong action) Each lock plate is crisp showing makers name; G. H. Daw . Dolphin shaped hammers. Barrel top rib is crisp marked GEORGE H. DAW., 57 TREADNEEDLE STREET, LONDON. Excellent and crisp working underlever action. Shiney bores. Original brown damascus twist barrels in a perfect condition. Barrel length 71 cm/ 28 Inch. Breech and trigger guard's tail are both marked with serial number 3757. Breech shows two London black powder proof marks; Crowned V.
Very nice rose and scrollwork on tang, back action locks, breech, but plate, trigger guard and mounts. Gold shield-shaped escucheon on stock showing Elephant head. George H. Daw was the later founder of the central fire shotgun and cartidge.